Best friends, Zach, Alice and Poppy have made up a fantastical world that they play out with dolls and figurines. The Queen in this world is a very old, fine bone china doll, that is kept displayed behind glass at Poppy’s house. When Zach unexpectedly refuses to play the game any more, Poppy and Alice remove the Queen from the cabinet, discovering that she is full of what appears to be some ashes. Poppy dreams that the Queen was really a girl called Eleanor Kercher who died in 1895, and she wants Poppy to return her to her grave. This quest leads Poppy, Alice and Zach on an interstate adventure, as they try to placate Eleanor, and fulfill her last desire. Doll Bones is an adventure ghost story, and it is also a coming of age story. Zach, Poppy and Alice are pre-teens still playing out the fantasy game of their childhood. Becoming haunted by the spirit of a lost and angry little girl trapped inside a doll, is the last true adventure of their childhood, as they move towards more teenagerish past-times. They embark on an epic quest into regions unknown in the middle of the night by themselves, vastly unprepared for such a journey. Add in a creepy doll, vivid dreams, unexplained occurences and misadventures, and you have a spooky tale indeed. 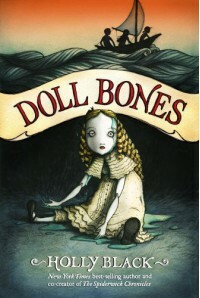 I hope that my second grader will give Doll Bones a read so I can get a true child’s perspective on the story. The story did flow well, and the character’s personalities really came through from the story, so it was a good book that I think many children would enjoy.